The SHL is a custom lighting solution for warehouse and shipping areas. The SHL series was designed on request to replace an overhead and dock light with just one light. The SHL provides 5 foot candles 20' into a vehicle and ample down lighting on dock or sorting area. With over 120 Lumens per Watt, our high quality, high output LED chips combined with a LG-Innotek driver deliver low-energy and low-heat output to maximize the life of LEDs. The SHL series provides up to 12,000 lumens of consistent, bright light. The SHL series has a lightweight aluminum hinged bottom mount. 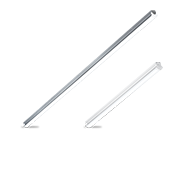 The extruded aluminum body adds strength to the entire fixture. The UL Listed junction box design leaves plenty of room for electrical connections. It includes knockouts for simple wiring and gangability. 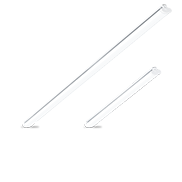 The SHL series' LEDs direct the light to allow 180° of evenly distributed off-axis light. The SHL is perfect for down and directional lighting in sorting and shipping areas. The impact-resistant frosted lens is durable and eliminates glare that causes eye discomfort. The SHL series was designed to be as maintenance free as possible. 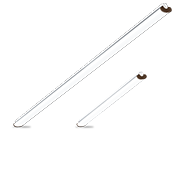 Sealed fixtures prevent dust and debris build up inside the light. The smooth, frosted lens allows easy wipe down. Standard replacement drivers are available for future needs, unlike other lighting products.